While floating exchange rates have day-to-day volatility, they don't provide the same drama as fixed exchange rates, which are prone to crises that are both political and economic. 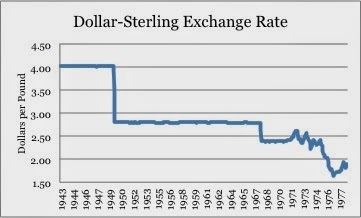 The postwar Bretton Woods system fixed exchange rates with the dollar (and pegged the dollar to gold), but countries were allowed to make discrete changes in their parities. Britain availed itself of this in 1949 and 1967. The Bretton Woods system ended in 1971 when the US announced that it would no longer redeem dollars for gold. 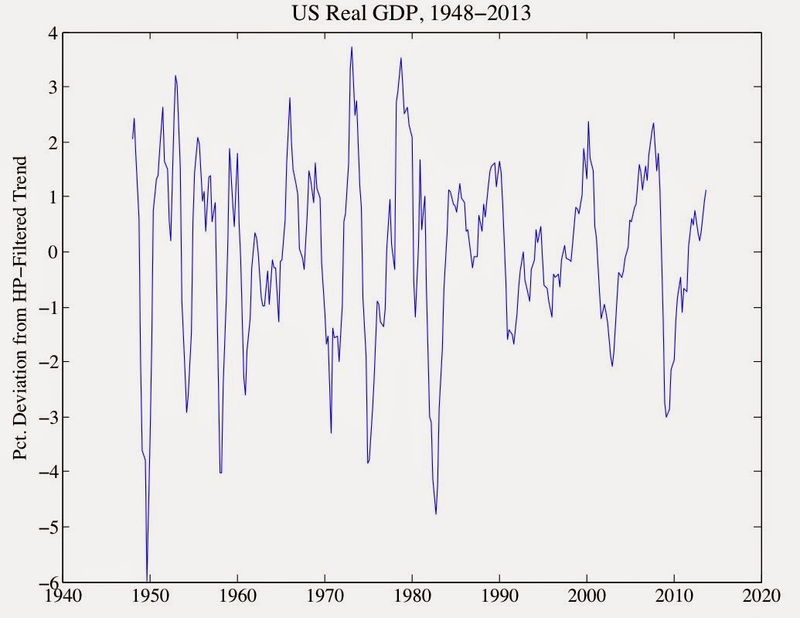 Sterling crises were not unique to the Bretton Woods era. Britain had left the gold standard in 1931 (after a very painful experience re-joining it in 1925). In 1976, a plummeting pound led Britain to turn to the IMF for a loan, and, on "Black Wednesday" in 1992, it was forced out of the European Monetary System. 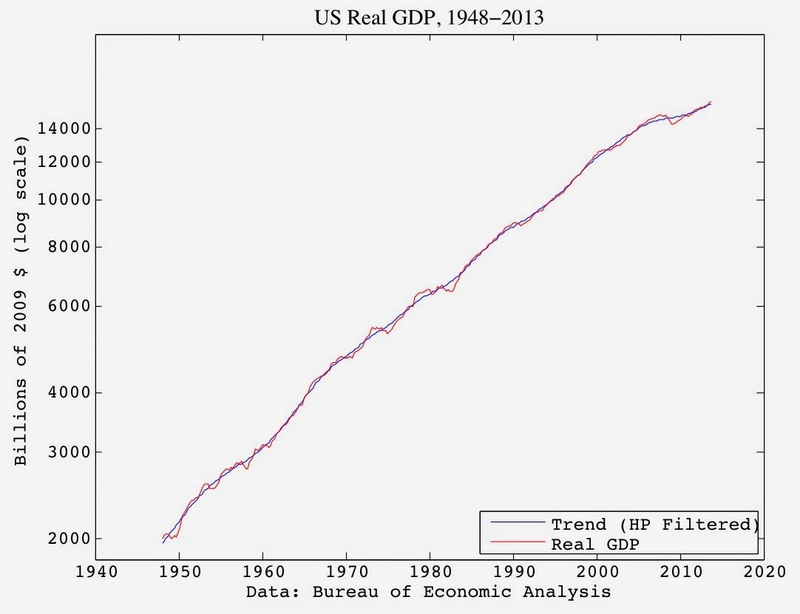 When we study "business cycles" we're studying the deviations of real GDP (red) from its trend (blue) path (the trend is the subject of economic growth theory). These are the business cycles captured by this method, and you can see at the end, the distance from trend is positive. So, we're "above trend"? Economy's not so bad after all?! 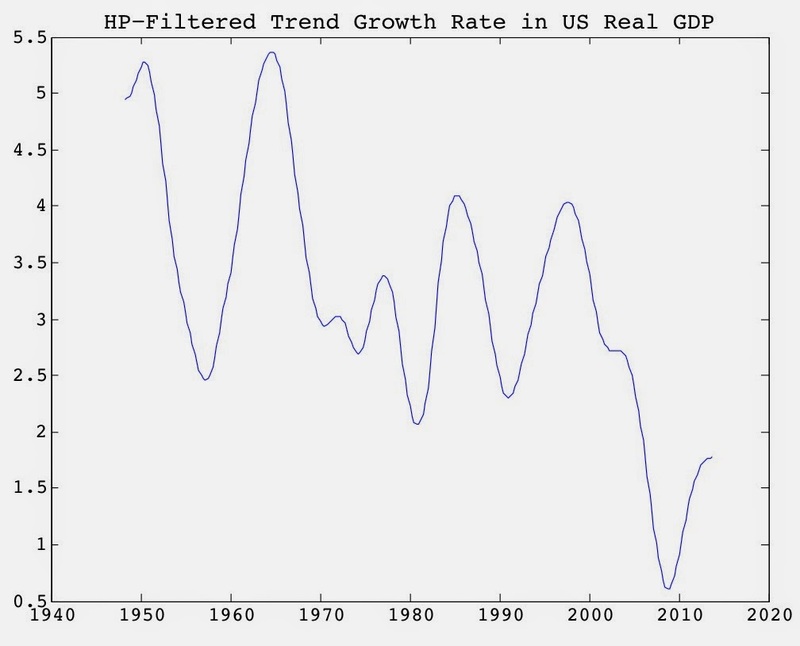 Well, not really... the way the HP filter works is that it chooses a trend that minimizes the distance between the trend and the underlying data, subject to a constraint limiting the change in the growth rate of the trend, which is what forces it to be smooth. The US economy's slump was deep and long enough that it pulled down the trend far enough that we're now a little above it. You can see how much, according to the filter, the last several years pulled down the trend path. I'm not sure whether this says more about the economy or the de-trending method (there's a whole literature on technical issues in de-trending...). But it does remind us that we need to be careful in how we use our tools and interpret their results (i.e., we should actually look at the graphs). 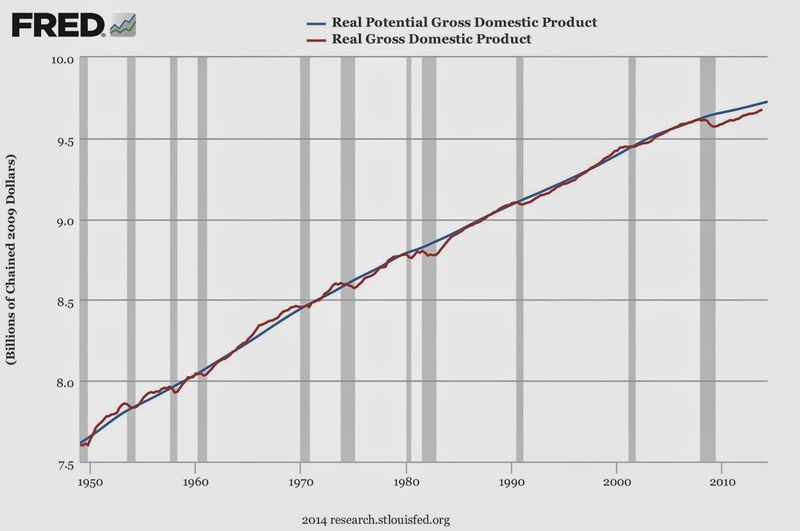 That is, we still have a long way to go to close our "output gap". The BLS released the employment figures for March today - a fairly good report overall, consistent with the trend that has predominated over the past several years of an economy that is recovering, but far too slowly. Nonfarm payrolls - the jobs number from the survey of firms - rose by 192,000. The unemployment rate remained at 6.7%, but in the survey of households which is used to calculate it, employment rose by 476,000. The reason the unemployment rate didn't fall is that the labor force - i.e., the number of people working, or looking for work, increased by 503,000. The decline in labor force participation has been one of the most troubling figures over the past several years, so it is good to see it rising again - in March, it rose 0.2 to 63.2%. 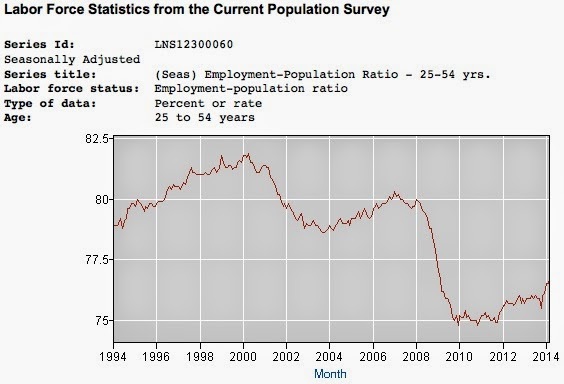 The employment-population ratio for people 25-54 also rose by 0.2 percentage points, to 76.7%. Looking at this statistic provides a rough way to control for the effects of the changing age distribution of the population. While it has shown improvement recently, its still considerably below its all time high of 81.9% from April 2000. 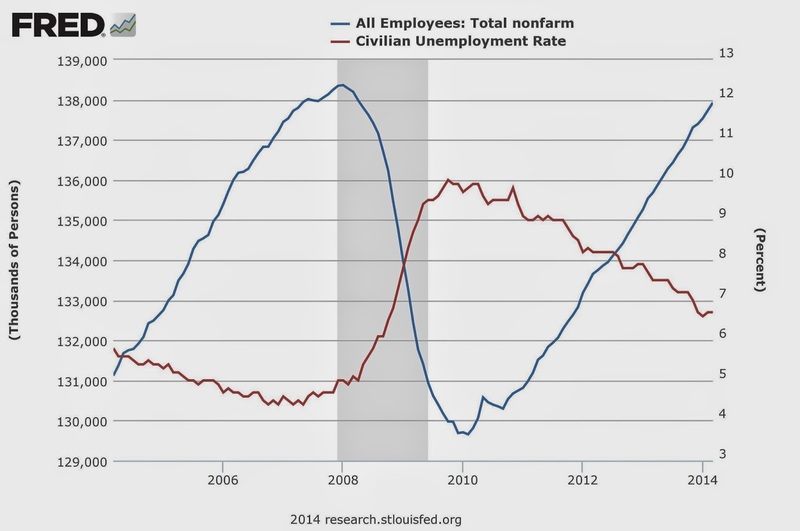 Overall, while the report was somewhat encouraging, 10.5 million people remain unemployed. The broader measure of un- and under-employment, 'U-6', which counts discouraged workers and part-time workers who would prefer to be full time, is at 12.7%. On a non-seasonally adjusted basis, the unemployment rate was 7.2%, down from 7.5% in February, and payrolls rose by 941,000 (i.e., March is a month that normally sees a big employment gain, which is removed by the seasonal adjustment).